Izayana was born in Ciudad Darío, Nicaragua. She is the fifth of ten children born to her parents, Maximiano Carcache (deceased) and Maria Nelly Pastora. Both of her parents and many of her relatives were teachers, so Izayana grew up among a tradition and family of teachers. With this example and with great pride, Izayana also became a primary school teacher, despite many obstacles faced during the Civil War. She began working at the age of 17 in an Early Childhood Special Education Center, called El Hogar Escuela. It was there that she developed a love for working with children with disabilities. Over the next 15 years she worked for the Ministry of Education as an elementary school teacher. She was also in charge of multi-grade and special education classes in different rural and urban schools throughout the municipality of Ciudad Darío. Izayana participated as a volunteer instructor in the National Literacy Crusade in the early 1980’s, and was a founding member of the local chapter of “Los Pipitos” (an organization of parents with disabled children) in Ciudad Darío. Of all the experiences that Izayana has lived, she finds most fulfillment in the magical moments when her students learn how to read. In 1992, Izayana married the co-founder of Seeds of Learning, Patrick Rickon. She had already worked with SOL as a volunteer, and helped develop some of the organization’s first programs in Nicaragua. The more she worked with SOL, the more committed she became to the mission. 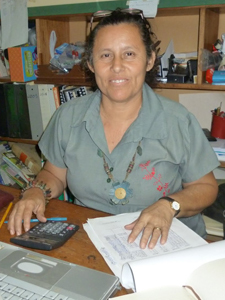 Izayana felt that SOL would be able to bring hope and facilitate dreams for her country. As a teacher, she faced many difficulties in teaching her students, as access to even the most basic of educational resources was scarce. It was the desire to change this sad reality that gave birth to the Learning Resource Center project, which she and Patrick designed after surveying the local population. “Now that 16 years have passed since we started this project, I am proud and amazed at the great number of children, youth and adults who have benefited. They have learned and developed skills, talents and vocations because of the great effort and humble volunteer beginnings of the Learning Resource Center. 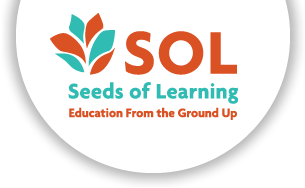 “I love what I do with SOL, and I feel that I practice my faith through service to others. The best gift is to see the joy of children, parents and grandparents when they take advantage the resources and benefits the Learning Resource Center has to offer.